The South Shore Genealogical Society is committed to promote genealogy by providing the services and facilities to interested person in their quest to research people of Lunenburg County and the South Shore area of Nova Scotia. To identify, search out, collect, preserve, copy, organize, any and all information regarding genealogical research on the South Shore area (Lunenburg, Queens, and Shelburne Counties); this includes church records, family records, family genealogies, books, micro-films, land records, wills, deeds, death records, etc. To make available all information we possess to all people searching our their ancestral lines. Conduct workshops, which teach how to accomplish this research and be an influence to all others to keep the necessary records so we remember we are as a people. To encourage an interest in genealogy, particularly amoung young people. To acquire by way of grant, gift, purchase, bequest, devise, or otherwise, real and personal property and to use and apply such property to the realization of the objects of the Society. To buy own, lease, mortgage, sell and convey such real and personal property as may be necessary or desirable in the carrying out of the objects of the Society. 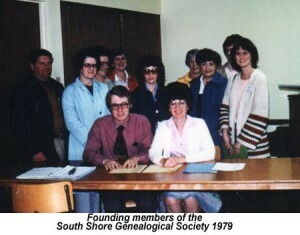 The South Shore Genealogical Society was founded in 1979.